Preheat oven to 350. Rinse the chicken and lay on paper towels to drain the water off. Combine the packet of Italian seasoning mix with the brown sugar, mixing well. Grease a 9x13 baking dish. Dip the chicken parts into the mixture, rolling around well to coat the entire piece well. Then place the chicken pieces into your prepared baking pan, with the top side of the chickenpart facing upwards. If you have any extra coating remaining, you can sprinkle itover the chicken pieces in the pan if you desire ( or not). Bake time is 50 to 60 minutes, or until the chicken is done. 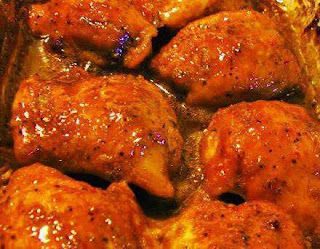 While the chicken is baking, turn it every 15 minutes and spoon the drippings over the chicken each time, with the final turning leaving the chicken with the top side of the pieces facing up for the last few minutes of baking time.